Brown’s Mart’s 2018 season is kicking off with a rare treat set in the time of the Salem witch trails. The Crucible opens the season as part of the education program with students from across the Territory getting a closer look into this classic 20th century work. 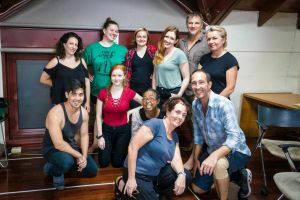 Director Merrilee Mills says there will be lots for Territory students and general theatre lovers to explore in this rendition of the 1953 play by Arthur Miller. “I want to create a sense that, amidst the chaos and all of the torture, pain and nihilism of the time, a feeling that we have moved on from that, and we somehow have to look for the light inside of that darkness,” she says. As an educator Mills is conscious of creating a show that students can examine on many levels. “What I want to do is present a piece that has some stylistic elements or conventions that the students will have to consider as theoretical elements – is it expressionism or realism?” she says. There have been a few challenges for Mills as director – coordinating a cast of 18, and condensing the four-act play to a suitable length. “The challenge for me is in choosing the moments and the scene that will generate the best question in the minds of the audiences,” she says. The show is the first for the Brown’s Mart season and executive director Sean Pardy says some of the other shows this year will take audiences beyond the theatre’s four walls. “We’ve been trying to use the Happy Yess space for a little while and there’s been a push for us to do a bit more outdoor work,” Pardy says. A Smoke Social, written by Sandra Thibodeaux and directed by Alex Galeazzi, is set in the venue where it will be performed in June – the Town Hall Ruins, where ‘smoke social’ parties were held to farewell enlisting soldiers. Phil Denson’s latest science-fiction work Singularity, will be performed in the Happy Yess space in October. But first cab off after The Crucible is the Griffin Award winning show The Turquoise Elephant, written by Stephen Carleton, directed by Gail Evans. The absurdist comedy is set in a world affected by climate change and will hit the stage in early May.